Best-in-class intake and consent forms for Cliniko. No scanning, no shredding, no paper. 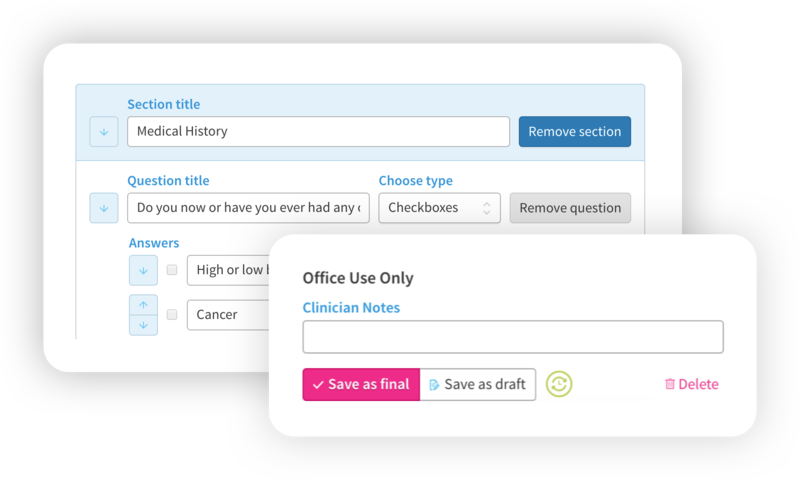 Create custom forms by importing Treatment Note Templates from Cliniko. Add your own policies and information screens. Ask any question you need the answer to. Forms filled from a treatment note template create a draft treatment note against the patient — add your own notes, finalise and you're good to go. Our #other-policy hashtag lets you present any statement to the patient, requesting their consent — great for cancellation or other policies. Perfect for informed consent — take your patient's signature with Finger-Ink. 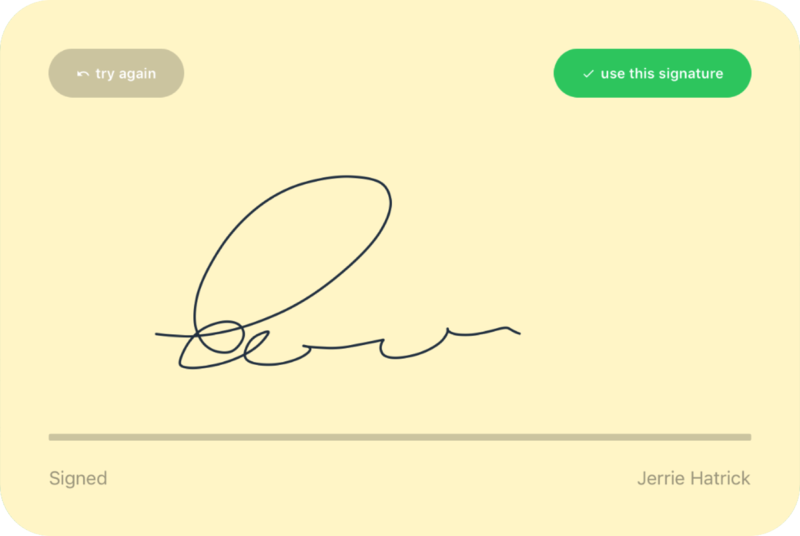 Multiple signatures are allowed so if you need to sign as well — no problem. A PDF copy of all answers (including any signatures) is attached to the patient record in Cliniko immediately after the form is filled. Security and privacy is extremely important to us. So much so that we designed the system to ensure no patient data goes anywhere near our servers — just your iPad and Cliniko. Click here to learn more about how we secure your data. How does a patient fill out a form? Patients can start forms for themselves via self check-in (provided they have an appointment), or your receptionist can find the appropriate appointment in the passcode-protected admin-area, before handing the iPad over to them. It depends on how many forms you'll be filling each month. We've recently updated our pricing with the goals of being both fair and predictable. If you're doing a low form volume — you pay only for what you use (and we don't sting you for going over once in a while). If you're doing a high form volume — you can go on an unlimited plan. Please see our pricing page for the specifics. Can this be used to get consent under the GDPR? Can I have multiple signatures? Yep — our forms can be customised to add as many signatures you want. Want to get a signature from both the patient and yourself on the form? No problem. Want to get a signature from a guardian? Sure! What do these forms update automatically in Cliniko? We allow most of the patient record to be updated in Cliniko. Additionally, a PDF copy of the filled form (complete with patient signature — and practitioner signature if enabled) is attached to the files section on the patient record. Finally, if the filled form was a custom form, a draft treatment note with the questions and answers is also created on the patient record. Why is a draft treatment note created after a custom form is filled? This is so Finger-Ink can be used to save time during the appointment — any patient-facing questions can be answered in the waiting room, before the appointment starts. You can then go over the patient's answers using this draft treatment note during the appointment, adding in any additional details, before finalising it. Is Finger-Ink available on Android? The Finger-Ink app is only available on iPads at present — that means not on Android, sorry! Can I send forms to patients in advance? The Finger-Ink app is designed to be used in your waiting room — and given to patients when they first arrive.